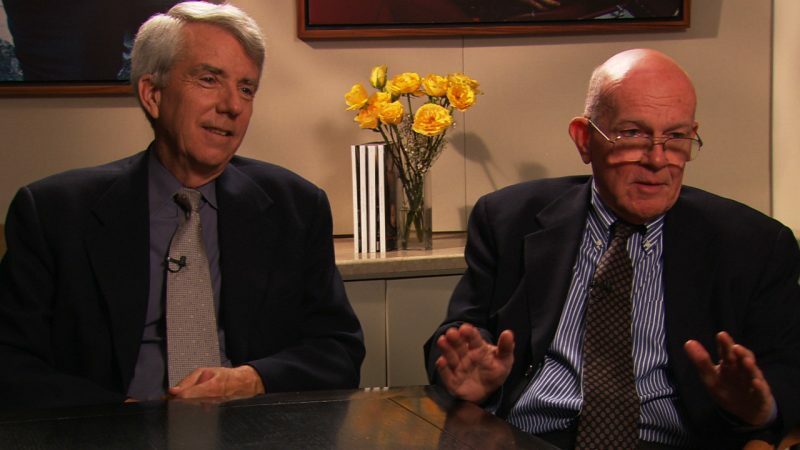 Winners of two Pulitzer Prizes and more than three dozen other awards, Donald Barlett and James Steele have been an investigative reporting team for more than 40 years. They have produced numerous bestselling books and the highest quality, in-depth journalism at The Philadelphia Inquirer, Time magazine and Vanity Fair. Their latest book, online and feature film documentary project is “What Went Wrong: The Betrayal of the American Dream” in partnership with the Investigative Reporting Workshop at American University. Donald Barlett and James Steele talk about their ground-breaking, nine-part series in The Philadelphia Inquirer called America What Went Wrong. The following URL links directly to the video or page. Copy and paste the code into your website to embed this video. Donald Barlett and James Steele say that most journalists are too reluctant to report on corporate power. Donald Barlett and James Steele talk about why they focus on taxes in their reporting. After one year at Pennsylvania State University, Barlett leaves school to begin building a clip portfolio. He works in Medina, Ohio, for three to four months, then moves over to a Sunday paper in Evansville, Ind., before beginning his first daily job for the Reading (Pa.) Times, where he completes his first investigative piece. Joining the U.S. Army, Barlett spends three years as a special agent in the Counter Intelligence Corps, conducting investigations of civilian government employees and military personnel. After leaving the Army, Barlett returns to Reading and shortly thereafter joins the Akron (Ohio) Beacon Journal. Growing up in Kansas City, Steele remains in the city for college, eventually graduating from the University of Missouri-Kansas City in 1967 with a degree in English. While in school he starts as a copy boy for the Kansas City Times and works his way through the ranks by first writing obituaries and eventually covering labor politics and urban affairs. Moving around frequently, in January of 1965, Barlett becomes a full-time investigative reporter at the Cleveland Plain Dealer. He later works as an investigative reporter at the Chicago Daily News. Leaving journalism , Steele briefly works for an international labor union in Washington, D.C., writing speeches and testimonies. Fascinated with broad, in-depth journalism, Barlett leaves the Chicago Daily News to return to the Plain Dealer before ending up at The Philadelphia Inquirer in 1970 as an investigative reporter. Interested in writing about urban affairs and enticed by Knight Newspapers’ purchase of The Philadelphia Inquirer, Steele takes a job at the paper. Barlett and Steele work on their first assignment together. After investigating for two months , they produce stories on how real estate speculators make millions by abusing Federal Housing Administration mortgage programs. The reporting team examines the international oil industry, dispelling corporate cries of an immediate oil shortage . Awarded their first Pulitzer Prize for national reporting for their series “Auditing the Internal Revenue Service,” Barlett and Steele expose the unequal application of federal tax laws, proving that the middle and lower classes are required to pay exactly what the government tells them while the wealthy pay on a smaller sliding scale in terms of what they actually owe. In their second book, “ Forevermore: Nuclear Waste in America ,” Barlett and Steele report on long-standing failures in the handling of nuclear waste. Examining the “rifle shot” provisions in the Tax Reform of 1986, Barlett and Steele reveal how targeted tax breaks benefit the very wealthy. The investigation takes 15 months and wins the Pulitzer Prize for National Reporting in 1989. The series spurs Congress to reject proposals that include special tax breaks for politically connected people and businesses. Culminating over two years of work and amassing more than 100,000 documents, Barlett and Steele produce a nine-part series, “ America: What Went Wrong? ” The series exposes how public acts and private greed in Washington and on Wall Street had devastated millions of Americans, eroding the middle class and changing the face of American society. The series is eventually published as a book with the same name . Continuing to examine the tax system, Barlett and Steele write “ America: Who Really Pays the Taxes? ” This book reports on the influence of the wealthy in the tax system and examines how the upper class was benefiting from government loopholes. Barlett and Steele write “ America: Who Stole the Dream? ” The book examines the growing divide between the middle and upper classes and exposes common misperceptions perpetuated by politicians and the media on the viability of America in the rise of the global economy. Barlett and Steele leave the Inquirer after 27 years and become editors-at-large at Time Inc.
Their three-part series, “What Corporate Welfare Costs You,” wins the National Magazine Award in the public interest category. Barlett and Steele expose the pervasive extent of tax evasion in their next book, “ The Great American Tax Dodge ,” further exploring the government’s double standard in enforcing tax law. In their book “ Critical Condition: How Health Care in America Became Big Business—and Bad Medicine ,” Barlett and Steele analyze disturbing realities of the health care system and offer alternative solutions. Barlett and Steele leave Time and start working at Vanity Fair as contributing editors. Two of their articles for Vanity Fair dig deep into the secrecy of private contracts and contractors in the Iraq war . Also for Vanity Fair, they write about their investigation into the threats, lawsuits and intimidating tactics by Monsanto Corp. in its efforts to scare farmers and rural business owners, effectively controlling a large portion of the world’s food supply. Barlett and Steele investigate how money was spent under the Troubled Asset Relief Program. In another Vanity Fair article , Barlett and Steele examine the globalization of the pharmaceutical industry and the Food and Drug Administration’s inability to regulate international drug testing. “Empire: The Life, Legend, and Madness of Howard Hughes.” New York: Norton, 1979. “Forevermore: Nuclear Waste in America.” New York: W.W. Norton, 1985. “America: What Went Wrong?” Kansas City: Andrews and McMeel, 1992. “America: Who Really Pays the Taxes?” New York: Simon & Schuster, 1994. “America: Who Stole the Dream?” Kansas City: Andrews and McMeel, 1996. “The Great American Tax Dodge: How Spiraling Fraud and Avoidance are Killing Fairness, Destroying the Income Tax, and Costing You.” Boston: Little Brown, 2000. “Critical Condition: How Health Care in America Became Big Business—and Bad Medicine.” New York: Doubleday, 2004. ® Investigating Power is a registered trademark.